You are here: Home › Blogs › GNU Press › Give GNU gifts and support the FSF! Are you shopping for a student just getting their footing in the world of free software hacking, a friend determined to spread the good news of software freedom, or a longtime free software supporter who needs the newest piece of Free Software Foundation (FSF) gear? The GNU Press shop has you covered. Here are a few of our most exciting offerings for this holiday giving season. 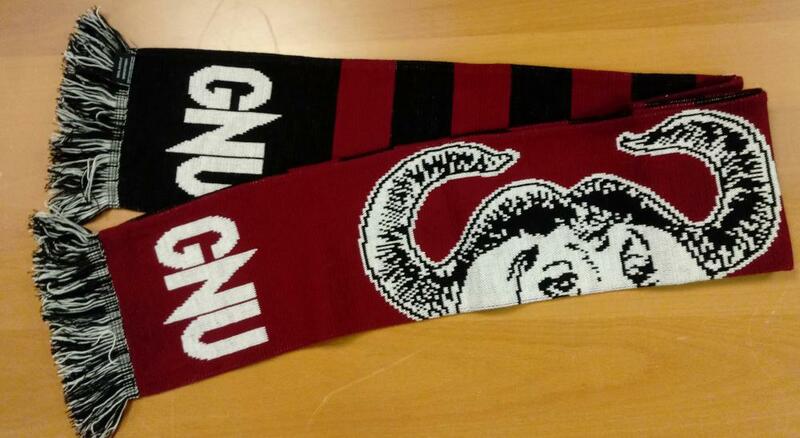 The GNU Scarf is brand new this year -- and just in time, if you are in the Northern hemisphere, for the chill winds of winter. It's long, warm, soft, and stylish, and features the iconic GNU mascot. The scarf is a perfect match for the newly-redesigned GNU Beanie -- in fact you can buy both together, and save money while staying toasty! Did you know that the GNU Press shop stocks autographed copies of Richard Stallman's books -- including the definitive document of the free software movement, Free Software, Free Society, presently in its third edition? It's informative and entertaining, and provides a great conversation starter for established believers looking to usher new free software supporters into the fold. There's much more on offer at the GNU Press shop -- we have plenty of handy manuals and other reference materials, snazzy stickers, dozens of excellent t-shirts, and much more. We'll be hustling extra hard through the winter months to meet demand for cool FSF merch, and we hope to meet your needs with alacrity and panache. If you have any questions or special requests, please don't hesitate to email sales@fsf.org! Happy holidays! By the way, the FSF's annual fundraiser is happening right now. Help us prepare for another year fighting for software freedom. Through December 8th, the Frâncu family will match all new membership donations, up to $10,000. We're about halfway to that goal, so there's still time to double your impact. Plus, all new and renewing annual FSF Associate Members ($120+) can choose to receive our new Four Freedoms t-shirt! So wear your freedom on your sleeve: become a member or make a donation today.